and order a calendar for yourself or a friend. Their snail mail address is PO Box 15511, Kenmore Station, Boston, MA, 02215-0009 and for orders via phone, call 617-427-9846. As the cover of one of my brochures says: â€œLook up!â€ I urge you to look up the lunar press online and order one of their calendars. Previous covers are posted for your moon-viewing pleasure, as well as letters of request for donations to keep the calendar in print. Take a peakâ€¦.itâ€™s moonificient! During my early years as a vegetarian, the “Give Peas a Chance” slogan was on T-shirts and bumper stickers. It emerged around the same time as the Vietnam anti-war protests, so the double entendre was clever. Giving peace a chance may be as difficult as giving peas* a chance. Perhaps the information and recipes below will change your mindâ€¦.. Snow peas, which are eaten with the pod, are flat and thin, with just a tiny bulge of the seed barely visible. These are often used in Asian dishes and can be enjoyed raw or barely cooked. (One of the sources noted that the Chinese were the first to eat the pod with the peas, but I cannot confirm that fact.) Sugar snap peas are plump like English (green) peas; they are quite sweet and the pod, like snow peas, is tender enough to eat whole without being shelled. These can also be used in Asian dishes or any dish of your choice. Again, sugar snap peas are delicious raw, although I find that removing the thin â€œstringâ€ along the inner edge of the pod improves its edibility. Nutritionally, peas differ, depending on which reference you choose, so I decided to use one from the Internet, since I felt that would be the most current information. According to www.peas.org, peas are a good source of Vitamin A, Vitamin C, folate, thiamine (B1), iron, and phosphorus. This pulse is rich in protein, carbohydrates, and fiber. In addition to being low in sodium, peas are also low in fat, and that fat is the unsaturated kind. 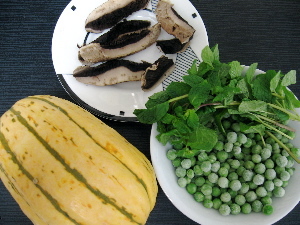 I hope you will try some of the recipes below and give peas a chance. Bianchini, F. & Corbetta, F. The Complete Book of Fruits and Vegetables. Crown Publishers, Inc. New York, 1973. Carcione, JoeThe Greengrocer. Pyramid Books, NY, 1973.
www.peas.org retrieved Nov. 30, 2006. 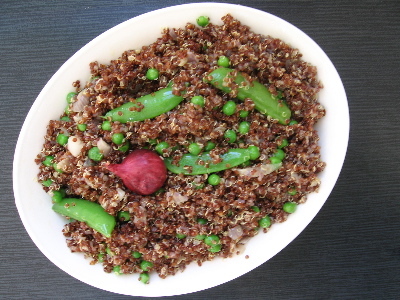 The recipes below are mostly side dishes using (organic) peas and vegetables. However, any one of them can be made into a main dish with the addition of some form of protein, such as chickpeas or green soybeans, tofu or tempeh, slices of cooked chicken or beef, etc. Feel free to do so. 1. Steam snow peas for 5-7 minutes. They should still be bright green and slightly crunchy. 2. While the peas are steaming, whisk together the oil, vinegar, soy sauce, and ginger. 3. 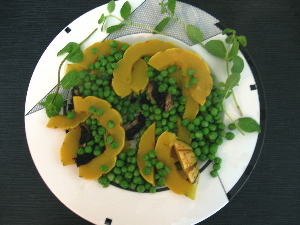 Rinse cooked peas under cold water briefly to prevent further color change. 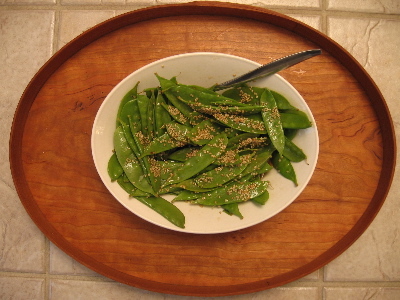 Toss with dressing and top with sesame sedds. This dish can be served warm or chilled. Feel free to serve over rice or bean thread noodles. 1. In a large, flat saucepan, bring to a boil about one inch of water or vegetable broth. Place carrot sticks, leek slices, and garlic in the pan and cook about two minutes. 3. Finally, add sugar snap peas and cook another one to two minutes. 4. 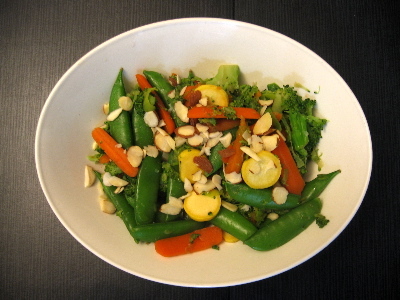 With a slotted spoon, remove veggies and toss with oil and soy sauce, and top with slivered almonds. Serve immediately. 1. Cut delicata squash in half and then cut that half into 1/2â€ rings, If the slices are two large around, cut each ring into halves. 3. Place squash in about one inch of water or broth in a large, flat-bottom saucepan. Cook for about 5-7 minutes, until almost tender. 5. Remove mint. Add cooked mushrooms and stir all three ingredients. 6. Using a slotted spoon, place veggies on a platter and toss with a little olive oil. 3. While grains are cooking, qhisk together the dressing ingredients. When the dish is fully cooked, place in an attractive boil and toss with dressing. Can also be chilled and served cold. Or, whatever is leftover can be served cold the next day. You are currently browsing the Menupause weblog archives for the year 2006.